Who knew botany could be so dangerous? Skirmisher Publishing has released Mutant Plant Monsters, a new supplement for the Mutant Future setting. As the name implies, it includes all sorts of mutations you can throw on plants to... well... turn them into truly horrifying monsters. It is possible to use plant creatures much more effectively than usual by using some real plant biology in conjunction with new mutations, and this publication shows how to do that. 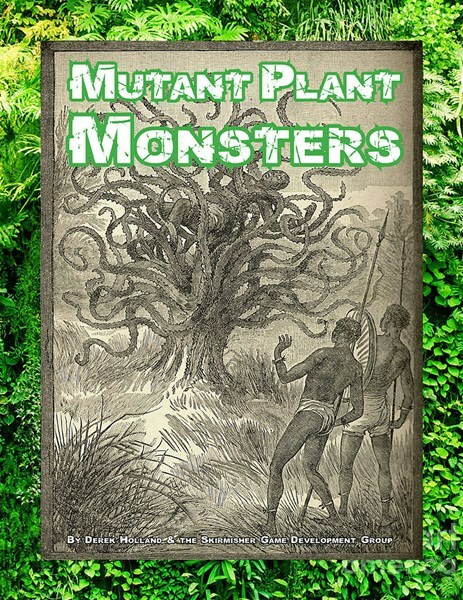 “Mutant Plant Monsters” includes 80 plant mutations, discussions of plant strengths and weaknesses, and six sample monsters that demonstrate how to use the various elements that appear in this sourcebook. Material in this publication was written specifically for the Mutant Future retroclone of Gamma World and can be used as-is with it and any other sci-fi, fantasy, or post-apocalyptic games that use the "Basic" version of the OGL system, and easily adapted to other games using the same core rules. It was written by prolific game developer Derek Holland.